Meet Me in DC. February 5-6, 2013. Just 15 days away, so you must let us know that you are coming! This will be a historic event and a special opportunity for you to meet with hundreds of victims and people filmed for the movie. February 4, 2013 -- For those arriving on February 4, we will have a meeting room at the Crowne Plaza National Airport Hotel in Arlington, Virginia where folks may come to pick up their packages to be delivered to their members of the House and Senate. We will also have areas set up at this hotel to do additional filming for the movies. And we will have an informal get-together at 7 pm at the Crowne Plaza. 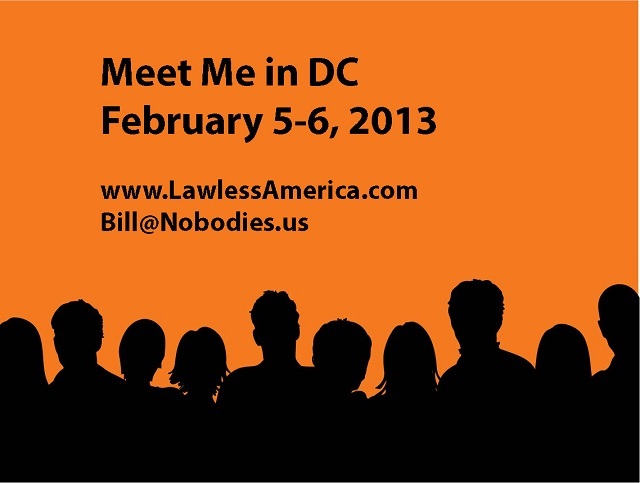 February 5, 2013 - 9:00 am -- We will begin distributing envelopes to each member of Congress containing the DVD with the Congressional Testimony filmed by Lawless America in all 50 states. Each attendee is asked to make an appointment with the office of your Representative and Senator. It is ideal if you can coordinate with a number of people in your area to make an appointment as a group. Addiitonal filming will be done at the hotel throughout the day and evening. Our meeting room at the Crowne Plaza will be open all day with tables for each type of corruption so you can return to the hotel after meeting with your Congressmen to share experiences and ideas with those battling the same corruption as you. 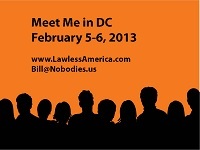 February 6, 2013 -- afternoon -- We will conduct a Phil Donahue-style event in which the Lawless America Nobodies will be seated in the ballroom at the Crowne Plaza and invited members of Congress and the media will be seated on stage. We will deliver our presentation from the audience seats.